Driving through the High Country is an awe-inspiring experience, and all of that beauty can leave travelers hungry for more than scenery. Lunch at a local joint or vino at a winery perk up any road trip, especially when you have a guide to appetizing pit stops in your pocket. 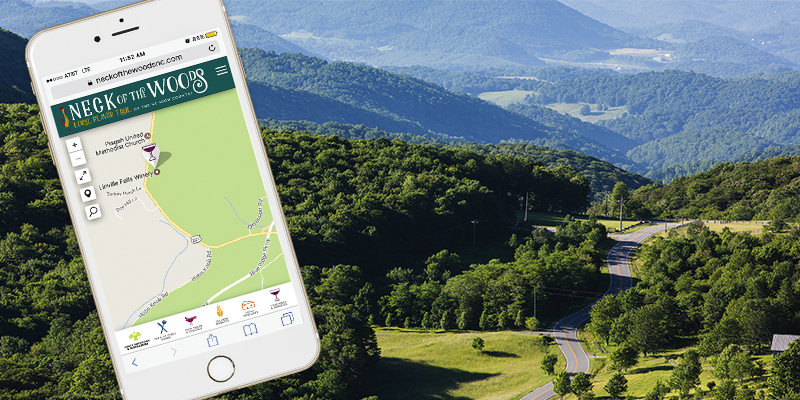 Neck of the Woods Local Flavor Trail (neckofthewoodsnc.com) highlights farm-to-table destinations with a mobile-friendly website and a print map that spans seven High Country counties. Visitors can create an online itinerary of craft breweries and distilleries, farmers markets, U-pick farms and farm tours, and restaurants that celebrate local food. “We’re hoping this will be a catalyst to push people out into all these counties and explore what the local food scene has to offer,” says project manager Matt Powell, who created the site with his Boone-based planning and design firm Destination by Design in partnership with the Appalachian Regional Commission and the Tourism Development Authorities of Boone, Blowing Rock, and Watauga County. Representatives from each county vet restaurants, farms, and craft beverage producers that want to join the project, which currently includes almost 90 businesses. The public can also nominate businesses to be included on the interactive website and on the print map, which travelers can pick up at visitor centers and other locations. Powell hopes the website will encourage people to explore the High Country while supporting the farm-to-table movement. Visitors can tailor culinary excursions to compliment their stay, and locals can check out nearby food and farms that will give them a new experience at the places they call home. Neck of the Woods puts High Country culinary culture at your fingertips—just bring your phone and your appetite.